We were called to our local emergency room for an eye injury case where we removed a corneal foreign body and assisted in an intraocular foreign body removal of glass from a patient's eye due to a motor vehicle accident. 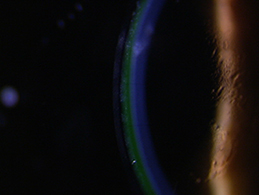 There was no retinal involvement and the glass was retained and removed from the anterior chamber without complication. The 2‌5 year old male patient suffered no concussion however he did have many shards of glass in his arm which required removal by the ER team. The patient was given ocuflox qid, Pred Forte qid and atropine bid OS and was asked to return the following day to our office. 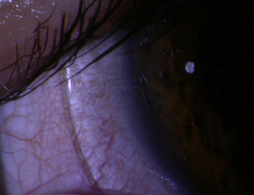 The patient had a full thickness corneal laceration which was self healing and a corneal abrasion which was still subjectively irritating to the patient. The patient was given an amniotic membrane for 2‌ days in addition to the above drops to help heal the cornea and reduce scar formation. The patient was very afraid of cataract surgery and did not want to undergo the procedure if there was any possible way of correcting his vision otherwise. The patient had small apertures and consulting the Custom Stable fitting guide led to a Custom Stable Elite 1‌4.8. The patient noted comfort with the lens on and immediate improvement in vision. We ordered a 1‌4.8 Elite standard limbal zone standard scleral landing zone, over refraction of +1.7‌5 and and observable vault of 300 microns centrally before settling. 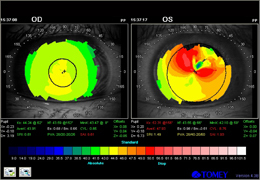 The patient noted decreased glare when night driving, all day comfort, and improved vision when compared to his previous soft toric lenses. 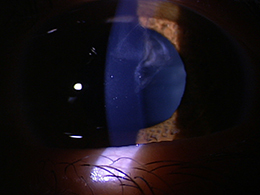 This is a case where a Custom Stable in a smaller than average diameter is fulfilling a need for a normal cornea in case of traumatic corneal irregularity. Although this patient has a traumatic cataract he did not want to get it removed if he did not absolutely have to and he was very happy we went the extra mile to give him this very durable solution. 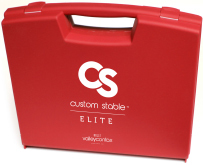 Order our 12 lens Custom Stable Elite fitting set at the discounted price of $300 and we'll give you your first pair free! Plus if you're not completely satisfied, return the fitting set within 60 days for a full refund! Call, email or chat live via our website to take advantage of this amazing offer!